Nabi (S.A.W) had stressed greatly on the adherence to the Sunnat and holding onto it firmly. He had expressed great sadness and also warned against abandoning it. This authentic narration explains clearly that it is binding upon every Muslim that he/she hold fast onto the Sunnat of Nabi (S.A.W) and his Khulafa-e-Raashideen (R.A). Besides this there is no other way. Delving and indulging in innovations leads one astray and bid’ah leads to deviation. This book explains in details what is regarded as Sunnah and what is regarded as Bid’at, or innovation in the deen. When one reads this book one will get a full appreciation and understanding of the matter. 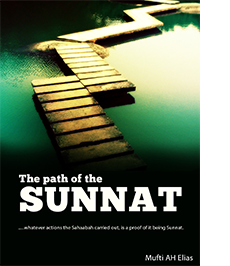 Leave a comment for: "The path of the Sunnat"